Oscar doesn’t do a whole lot at the weekends. Football, Rugby, Swimming, Dance, Performing Arts; the local provision for extra curricular activities just does not work for my autistic son. So when Oscar became old enough to try our local Haslemere Lego club, Brilliant Bricks, we were cautious. 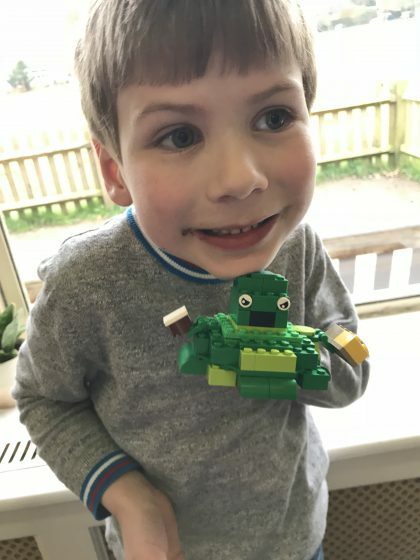 The first time we took him along, we sat in awe, as the children were firstly inspired by the leader, Sarah, and then started to build with gusto. But a really calm gusto! It was magical. And Oscar could join in. He could join in without having to compromise on what he could cope with or stand out because he needed to do things differently to the others. What a treat. It really wasn’t too crazy to organise either. The biggest issue I had with the whole party was trying to get RSVPs back, but in my experience that’s often the worst bit about orgainsing any event. Last year’s party was good, but by far the best idea I had was how to serve the food. What I have found at other people’s parties we’ve attended is that a long line of tables can be intimidating for Oscar (he often ends up sitting on the end) and will only eat from the bowls/plates in front of him. So last year and subsequently this year I put together a picnic bag for each child. These were given out and allowed the children to sit where they felt most comfortable and eat the food in whatever order made most sense to them. The bags this year had a bag of Wotsits, a Frube yogurt, a snack pack of Oreos and a YoYo Bear Fruit Roller. I was able to put the bags together the bag before and simply hand them out on the day. Picnics in brown paper bags. The kids loved the autonomy they were given over their food. 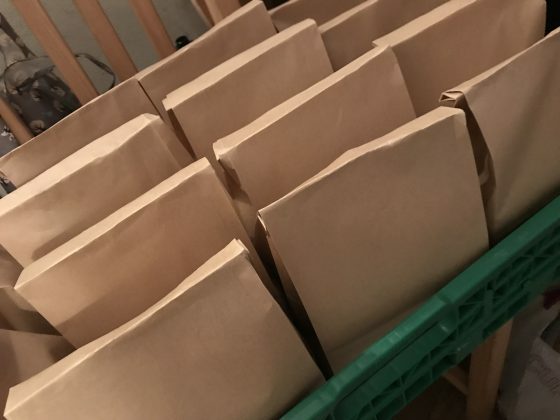 I then made sandwiches and handed them out alongside the bags. Oscar insisted he wanted Nutella sandwiches and who am I to argue with the birthday boy? I did convince him to let me do cheese ones as well, just to show willing!! While the rest of the food was in no way themed (and rather was what I knew Oscar would eat!) I decided on a nod toward the Lego theme with the sandwiches. I borrowed a Lego Head Cutter, bought an Edible Marker. And the result was even better than I hoped! 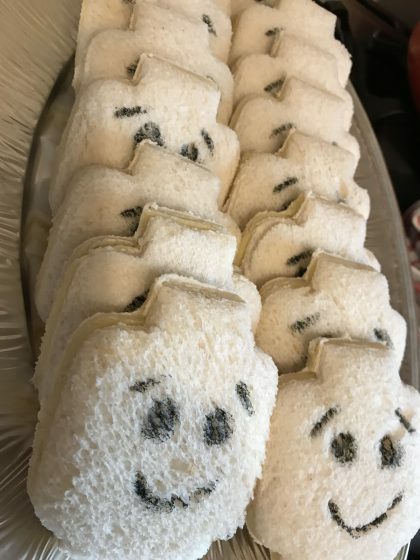 How cute are these Lego Head sandwiches? The kids seemed to really like fun sandwiches. Although to be fair they seemed more excited to see I’d used Nutella (sigh!). I really don’t like party bags. Don’t get me wrong it’s lovely that people want to give children a little parting gift, but too often (for me) they just contain landfill fodder. Or worse they contain things that should be binned, but Oscar insists on keeping them! So I’ve never done the traditional kind of bag. And this year was no different. 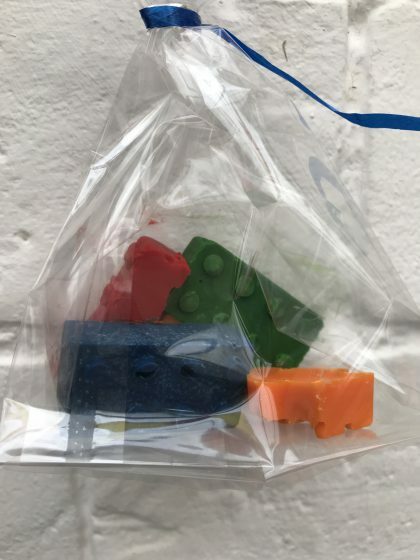 In keeping with the Lego theme I decided to make a bag of Lego chocolates for each child. They were the easiest thing to make. 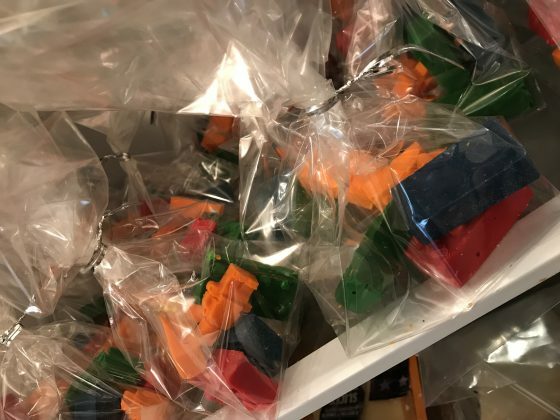 Just get some Lego Brick and Figure silicon moulds (I borrowed mine). Melt some white chocolate, slowly mix in some food colouring (I use the extra strong Wilton Gel Colours), pour it in the moulds, tap to get rid of any air bubbles, scrape the top to remove excess chocolate and pop them in the fridge. Leave them for an hour and Bob’s your Uncle! The kids loved them! I got a message after the party telling me one little boy loved them so much he wanted to display them on his shelf rather than eat them! How cute is that?! So many people asked if I was planning to make Oscar’s cake and I happily told them absolutely not. I can make a decent enough cake, but decorating it is not my forte, especially when Oscar has such specific ideas of what he wants. 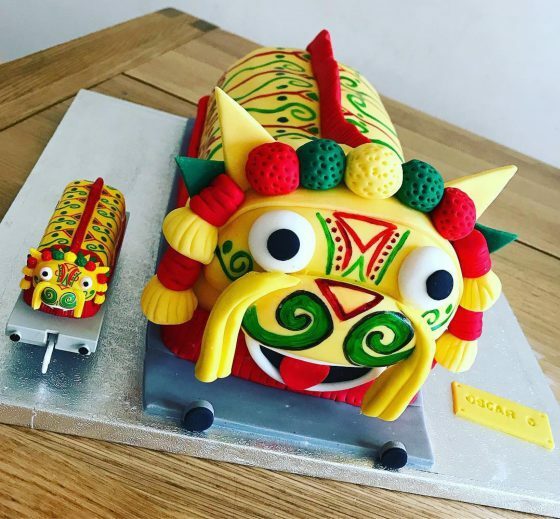 This year he asked for a cake in the image of the Thomas and Friends Chinese Dragon we got him for Christmas. So I happily handed over the toy to my friend and Haslemere cake maker extraordinaire Sarah of Sarah Bakes Cakes. And boy did she do us proud!! Just look at that detail! I adore this cake! Oscar was absolutely thrilled with his cake. When Sarah bought it round the day before the party, he actually squealed in delight and ran up and down the stairs he was so excited. It was the cutest thing! He also loved tucking into the delicious chocolate cake and probably ended up eating up more of the cake than any one! 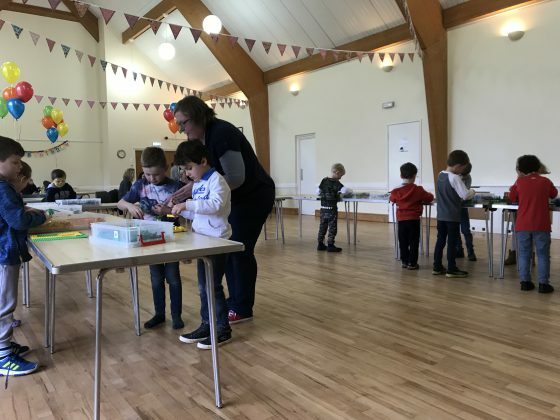 Watching thirteen (we invited eighteen but not all could make it and some didn’t show up on the day) 6 year olds quietly and calmly build Lego creations completely from their imagination was a pure joy. The concentration, from those not always known for their ability to concentrate, was quite amazing. 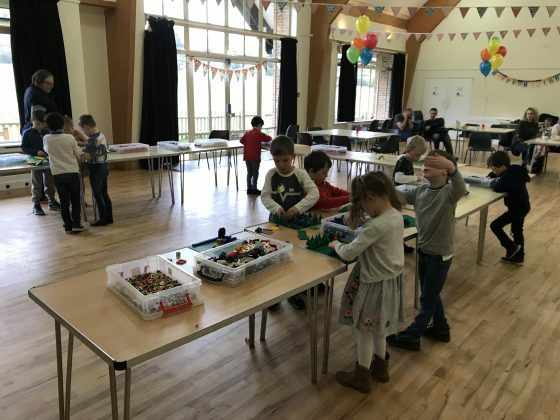 Thanks to the support of Sarah and Brilliant Bricks, I was much more confident to let the parents leave their children with me, but those adults who stayed or came to help couldn’t get over how calm the party was. The children moved from box to box sharing the tonnes of bricks Sarah had bought with her, but not being expected to collaborate. This allowed everyone to join in no matter what their capacity or their personality. 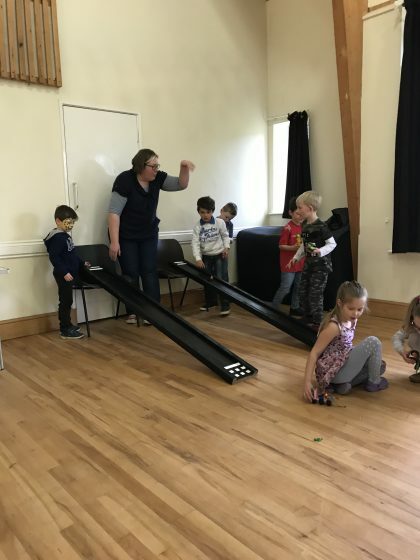 Sarah bought her ramps with her for the children to race their creations down! The party was so much more of what Oscar needed than last year and I like to think that reflects how much more I understand him and how to work to get the best out of him. This happy face and amazing Slimer (who is holding a “pizza in one hand and a chicken with a bone in the other”) will, I hope, testify to that. I don’t think I’ll be holding a party for him next year. I’ve got a feeling he’ll be over them by then and prefer to do something more based around his interests, without having to worry about other children. So this might be the last party I ever host for my little guy. And if it is, what a high to end on. Thank you so much to everyone who came to the party or supported me throwing it, in one way or another! I have included my supplier links as a personal recommendation only. I paid for everything myself.